Susan Pridmore lives with her husband just outside San Francisco and writes The Wimpy Vegetarian blog. Shortly after cooking her way through culinary school she moved her diet to mostly vegetarian, to the horror of her resolutely mostly carnivore husband. She creates and publishes “omnitarian” recipes for people feeding both vegetarians and omnivores at the table, and for folks just wanting to add more fruits, vegetables, and whole grains to their diets. She writes a monthly column for The Weiser Kitchen called Steak and Kale, and will be writing a column for Food52 later in the fall. You can also find her on Facebook, Twitter, and Pinterest. I’m a drug addict. Some days it’s all I think about, that white stuff that makes me feel so good. But it’s not just the ubiquitous white granulated crystals that we all have stashed away. I’m equal opportunity. Molasses, coconut sugar, date sugar, honey, maple and agave syrup, c’mon over. I have an entire shelf dedicated to you guys. Sugar may be one of the biggest addictions today and we hook the kids when they’re young, barely old enough to walk. At some point this year, about the time I realized two desserts a day were no longer enough to satisfy me, I faced the sober truth that I had a problem. No amount of healthy greens and grains – and I eat a lot of kale and quinoa – was going to offset this much sugar. I decided to eliminate sugar from my diet for one week, and because this is the age of social media, I found a buddy group through a Twitter party so I wouldn’t be traveling alone. I figured I could do anything for a week. It wasn’t easy. Sugar is added to more foods than you would imagine. I was overwhelmingly aware of nightly bombardments of sugar-infused TV commercials after dinner. And all those sugar and chocolate treats deliberately placed within easy reach for the impulse buy while I waited to put my kale on the conveyor belt at the grocery store was just mean. I wavered. Completely eliminating sugar just wasn’t realistic. I hopped online to research alternative sugars. Stevia shot to the top of the list with its carb- and calorie-free benefits. But like anything else connected with food these days, there was controversy. A lot of stevia on the grocery shelves is highly processed, with much of it mixed with various forms of sugar like dextrose. I couldn’t win. And then I found a couple of plants at the nursery. You’d have thought I found a suitcase of money. I was that excited. My first experiment was to dry some leaves and whirl them in a spice grinder. I added a pinch of the stevia powder to my morning yogurt and was thrilled with the result. It doesn’t take much to do the trick since the leaves are 30 – 50 times sweeter than sugar, and the sweetest part of the leaf is a mind-boggling 300 times sweeter. The down side was the powder didn’t melt in my tea and I was tired of leaf bits in my mouth. It was just a little too natural. I needed to make stevia extract. It took two ingredients and 36 hours, but most of that time was spent sleeping, hanging out with friends, and writing. The big question is always “How does it taste?” I’ll be honest, there’s a faintly bitter aftertaste, similar to some sugar substitutes, but less than I noticed in the powdered form. 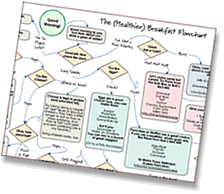 Whether I notice it at all is completely dependent on the food or drink I add it to. I notice a little aftertaste in my tea, although it’s not objectionable, but not at all in my plain yogurt or salad dressings. I should emphasize: the aftertaste can be managed somewhat through the amount of time the leaves steep in alcohol, and by the level heat applied at the end. I can’t say I’ve completely kicked sugar. It’s work in progress, like most things. But when I get sugar cravings in the afternoons or evenings, I reach for a cup of tea sweetened with my stevia extract and some fruit. Often, that’s all I need. I’m down to only a couple of desserts a week, a huge improvement. Well, except for the month of October, of course, when we all take the October Unprocessed Challenge with Andrew. Here’s how to make your own at home. 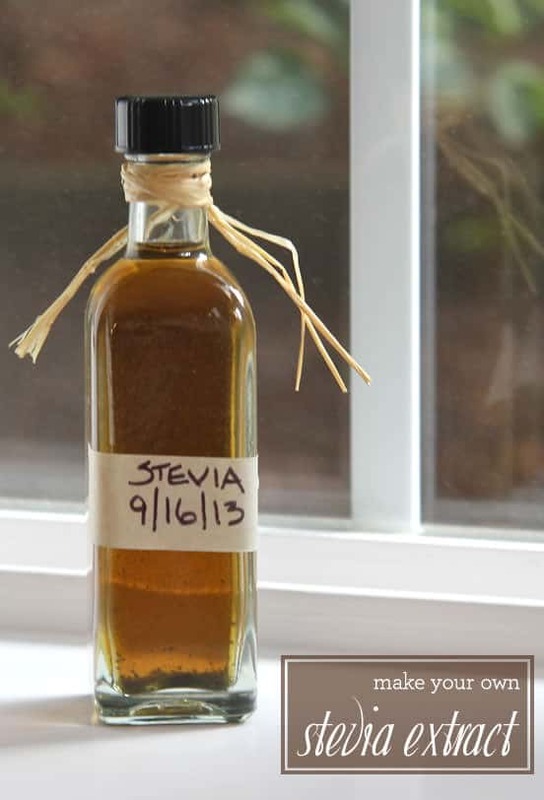 Making your own stevia extract couldn’t be easier. But first you need a stevia plant. I’ve heard you can buy the leaves in some specialty stores, but have yet to see them. I’d love to hear from you if you’ve seen them out there. As a note, some people use both the leaves and stems, but I feel the stems add to the bitter aftertaste. I strongly recommend only using the leaves. Wash the leaves, dry them, and stuff them into a clean jar. Fill the jar, loosely packing the leaves. The more leaves you have, the less time it will take to infuse the liquid. Pour enough vodka into the jar to completely cover the leaves. Vodka is commonly used for many extracts because of its neutral flavor. Place a lid on the jar and set it on the counter for at least 24 hours. Test the liquid for sweetness. You’ll taste alcohol too, but just focus on the sweetness level. Continue to steep the leaves until you reach the amount of sweetness you want, but don’t go past 48 hours. Longer than 48 hours results in a dominant bitter flavor. I steep my leaves for 30 - 36 hours. Place four layers of cheesecloth or a couple of coffee filters over the jar and strain the liquid into a small pot on the stove. Discard the leaves. Warm the liquid over medium-low heat, being careful not to bring it to a boil. I keep it at barely a simmer with an occasional bubble or two. You’ll notice the alcohol burning off right away. Continue heating the liquid for 30 minutes. The extract will darken to pale amber, and dark particles will be apparent. Strain the liquid again and pour into a small jar. The extract can be refrigerated for up to three months, so be sure to label the jar. You rock, Susan! 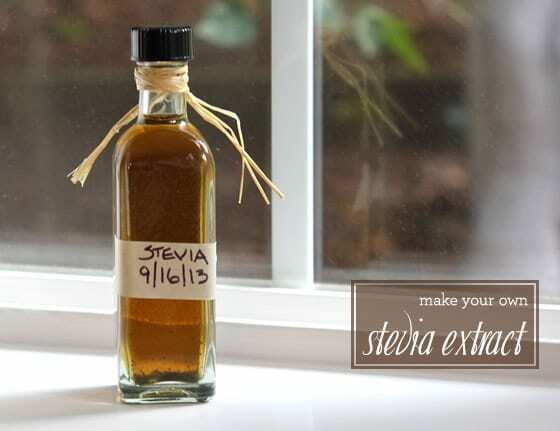 I’m so impressed you made your own stevia extract. Such a great way to reduce your sugar intake and reduce waste by growing/making your own pantry items at the same time. I’m definitely trying this…someday! Thanks so much Erika!! Having these stevia plants have been so fun. And so practical for reducing sugar. The whole sugar reduction is just so hard! I love the idea to add vanilla bean to the mix. Now if I would find some leaves, I can for sure come up with the vodka! I love that vanilla idea too, Letty! I got my stevia plants at the nursery and they’re still going strong. I’ve heard that you can find them in some health food stores, but I’ve yet to find them there. That’s a GREAT idea Anne! I’m going to try that on my next batch. It makes sense to me that it would work. Interesting. I have a whole board on Pinterest devoted to extracts and infused liquors. I’m gonna add this recipe. I can plant Stevia now where I live so I should be reaping the benefits in a few weeks. BTW, Kathryn, I’m going to look for your Board. I definitely want to follow it! Awesome! Where can I purchase stevia leaves? Thanks! I got my stevia plant at my local nursery back in June, Sara. I’ve heard you can buy leaves at health food stores, but I haven’t seen any at mine. Another option could be to ask your local nursery to order some plants. I ordered mine through Amazon. Starwest Botanicals organic Stevia leaf C/S. It’s pricey (I think? Never bought it this way before lol!) But I paid about $9 for 4oz, but it’s actually a lot surprisingly! Starwest Botanicals is a fantastic company and if not ordering through Mountain Rose Herbs I buy from them, then 3rd I buy from Frontier Co-op also on Amazon. Hope that helps someone even though I JUST REALIZED this is from 2013 haha oops!